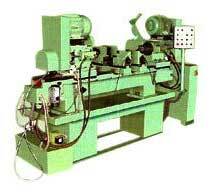 We are enlisted amongst the reliable Centering Facing Machine Exporters and Suppliers in India. The Facing Machine offered by us ideally designed to meet applications like centering, plunge facing, chamfering etc. External turning of the two ends of the bar stock simultaneously i.e. camshafts, crankshafts, motor-shafts, universal joints, spiders etc. Moreover, this ensures perfect alignment of centers, accurate lengths and true end. Customers are eased with the availability of the Centering & Plunge Facing Machine loaded with all the advanced features. Model CFAM500: for work pieces with max lengths of 500mm. Model CFAM1000: for work pieces with max lengths of 1000mm. Model CFAM1500: for work pieces with max lengths of 1500mm. Model CFAM2000: for work pieces with max lengths of 2000mm. Max Plunge Facing Diameter: 63mm a. Higher diameters are possible at an extra price.